Watch liquid metal morph into shapes. How long until the T-1000? In the cult blockbuster Terminator 2 we’re introduced to a new series of killing bots – the T-1000. 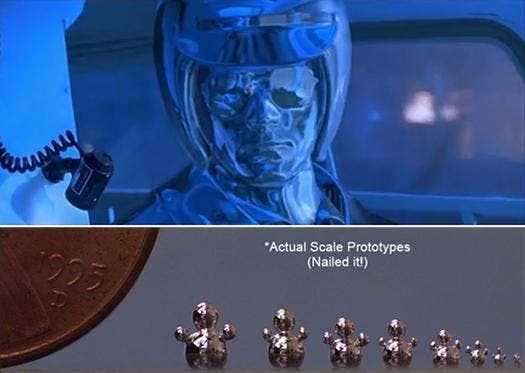 More than just “cybernetic organism, living tissue over metal endoskeleton”, the T-1000 could turn into liquid metal then morph into any shape, be it another person or an oversized man-spike. It also made the T-1000 freaking hard to kill! For a long time, scientists have argued how scientifically inaccurate the whole plot is, since liquid metal can’t form into non-spherical shapes due to surface tension. Now, researchers at North Carolina State University have demonstrated that this isn’t true entirely. The team applied an electrical charge to a gallium alloy, which is stably liquid at room temperature, and found they could manipulate its shape. At first they couldn’t explain it, but after three years of studying the phenomenon the researchers conclude that the liquid metal can morph because the applied voltage causes an oxide coating to form on the surface. This oxide coating changes the surface tension of the liquid metal where it meets the water, and disappears instantly once the voltage is gone. “Scientifically this is one of the most exciting projects I’ve ever worked on because nothing in the literature explained it,” Dr. Michael Dickey, an investigator on the study, tells Popular Science. The researchers argue that morphing metal liquids could host a broad range of applications, from circuits which transform for a new task, to space telescopes which can morph to change focus. The gallium alloy’s oxide surface is too strong in air to allow for the same effect out of water, but researcher believe a similar effect might be produced in other materials under different conditions. So, what about a T-1000? Well, as Dr. Dickey mentions: there are two big primary forces that dominate shape and behavior, and you can’t sustain a human-sized liquid metal shape since at that kind of density gravity takes over from surface tension. But, hey, who knows!